The W506 is Blacklion's studdable winter passenger tyre designed for drivers looking for unparalleled traction on ice and snow. The W506's directional tread, with deep snow evacuation grooves and serrated biting edge sipes, marries a smooth quiet ride with aggressive winter traction. 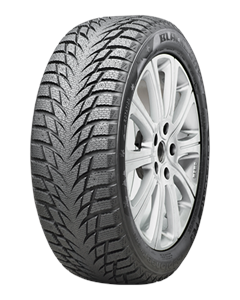 The W506's tread design is engineered to provide excellent turning and stopping capabilities. Directional arrowhead tread pattern features serrated channel design to improve traction on ice, snow and mud. Lateral sipes increase contact area to improve grip and handling in ice and snow conditions, without compromise to ride comfort. Specially formulated environmentally friendly cold-resistant compound ensures that tires stay soft in order to provide excellent traction and handling.